Editor’s note: Baseball is back and Yahoo Sports is previewing all 30 teams over the next month. This year’s previews will focus on fantasy and reality, as our MLB news staff and our fantasy baseball crew come together to assess each team before opening day. Next up, the Philadelphia Phillies. Now Bryce Harper has to prove he’s worth the money. The biggest free agent in a decade chose the Philadelphia Phillies and immediately vaulted them into position as the NL’s most interesting team — and the team with the highest expectations. Philly isn’t a place where you can sign a $330 million deal and take your time getting into the groove. 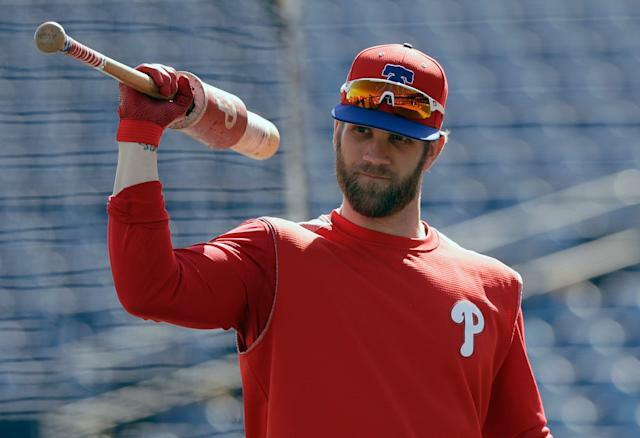 Phillies fans are hungry for success after a stellar offseason and it would be best for everyone if Bryce is knocking dingers out of the yard on opening day. Succeeding in the NL East this year will be tough. Every team except the Miami Marlins have a reasonable shot at winning the division. The Phillies, on paper at least, might have the best shot, but not by a ton. There’s fantasy value to match the intrigue in Philly too. Fantasy owners might be as picky as MLB owners about Harper (is he a first-round pick? ), but there’s plenty of other things to like. New catcher J.T. Realmuto is one of them, but again, how much are you willing to pay? Jean Segura, who came over in a trade with the Seattle Mariners, should be a big contributor in that lineup. Rhys Hoskins will benefit greatly from having Harper around, and heck, Andrew McCutchen, who signed as a free agent, might even be worth a look if you’re fully on the bandwagon. Then there’s Aaron Nola, now firmly the Phillies ace, who is quite an attractive pick, but also won’t be cheap. The Phillies didn’t just go get Harper, they also pulled the trigger on one of the most sought-after trade pieces of the offseason in Realmuto. Beyond McCutchen and Segura, they also upgraded their bullpen with pitcher David Robertson. Quite simply, no team did as much to improve their World Series chances as the Phillies, and that should always be the goal, shouldn’t it? Who is Philadelphia’s biggest fantasy trap? What is Philadelphia’s biggest fantasy question? The Phillies have plenty of reasonable candidates for the top two spots in the order, but only two men can man those positions. Solving the table-setter question is a key assignment for fantasy owners, because the loser among the McCutchen/Segura/Hernandez trio will likely bat eighth or ninth; a kill shot in NL lineups. You probably won’t see many Phillies prospects make a huge impact in the majors in 2019. The majority of the team’s most talented youngsters are still buried in the low levels of the minors. 1. Cut down on strikeouts: Only two teams in MLB struck out more than the Phillies (1,520) last season. That number clearly has to come down, and it likely will given their roster changes. For example, new additions J.T. Realmuto and Jean Segura combined to strike out 171 times last season in 1,063 at-bats, whereas Asdrubal Cabrera and Jorge Alfaro, the players they're replacing, combined for 219 strikeouts in just 719 at-bats. The newcomers should get the ball in play more often, which will make the offense more efficient. Of course, Bryce Harper will add his share of whiffs to the mix, but the Phillies would trade that for 40-plus homers. 2. Gabe Kapler gets comfortable: Kapler’s debut season as Phillies manager hit some pretty significant bumps. His season started with questionable in-game decisions, particularly with his bullpen usage. It ended with the Phillies in a tailspin that he seemingly had no answers for. No team had ever been 15 games over .500 as late as 113 games into a season and not finished with a winning record, according to NBC Sports Philadelphia. Kapler’s Phillies became the first. It wasn't entirely his fault, but he has to be part of the solution this season, not the problem. This is probably too on-the-nose, but that’s OK. There’s really only one satisfactory outcome for the Phillies this year and that’s a World Series win. Or, in other words, a championship. 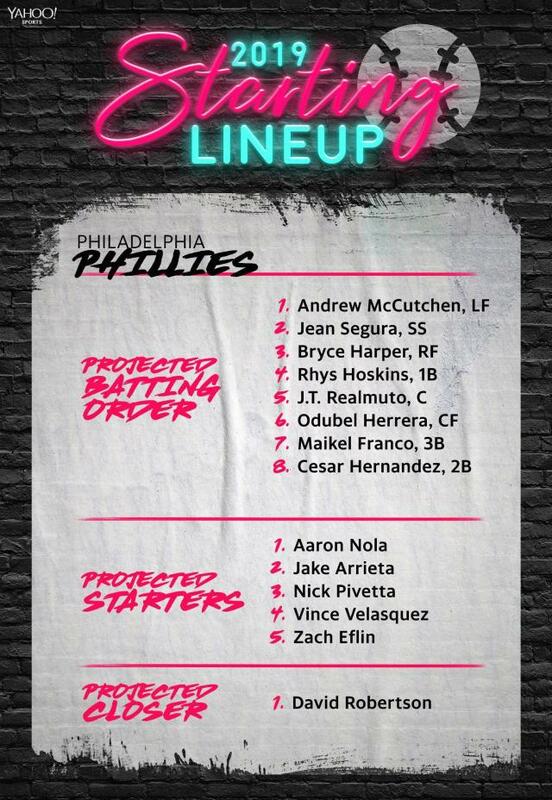 So the Phillies’ walk-up song is Philly’s own Meek Mill title track off his most recent album, which is titled “Championships.” No pressure, Bryce.